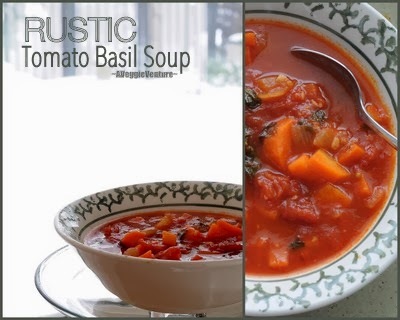 Today's vegetable soup recipe: It's Tomato Basil gone all rustic, showing off its pretty red, green and – hey! what's that orange stuff? - colors. Weight Watchers Friendly. Low Cal. Low Carb. Gluten Free. Not just vegan, "Vegan Done Real". Across the country, lots of people are seeing "white" this weekend. Me, I learned two things, not bad for just coming off the holidays, eh?! Our new glass-on-two-sides kitchen is a lovely during a snowstorm: warm and cozy inside, so white and windy outside, like being out in the middle of a snowstorm but warm and dry with a cup of hot cocoa in hand. Keep it comin,' Old Man Winter, today was a good day! Yeah, yeah, I know, the basil came from a pricey plastic package. But even for a committed seasonal cook, to my taste Tomato Basil Soup is a winter soup not a summer soup. Usually, it's blended until smooth but I found the tomatoes and carrots and basil so pretty, I left it in its natural rustic state. What do you think, isn't it pretty? And I'm smitten when a dish hints at what's inside. Left rustic, it’s obvious there are carrots in this tomato soup! Why? The sweetness of the carrots helps balance the acidity of the tomatoes, they really make a difference. In a large pot, heat olive oil until shimmery on medium high. Add carrots, onion, garlic as they're prepped, stirring to coat with fat with each addition. Stir in the basil and sugar, let cook, stirring often, until the carrots begin to take on a little color, this is really key to developing the flavor, don't hurry the process. Stir in the wine and cook for about five minutes, this cooks off much but not all of the alcohol. Stir in the tomatoes and vegetable juice. Bring to a boil, cover and reduce the temperature to maintain a slow simmer. Let simmer for 30 minutes. Season to taste with salt and white pepper. I opted for two tablespoons of olive oil, double what I'd typically use. It just helps to help develop the flavors in the carrots and onions as they cook. It can be done with less oil, I do it all the time, you just have to use a lower heat and stir more often. If you're going to leave the soup in its rustic, unblended state, take care with the size and shape of the carrot pieces. TODAY'S VEGETABLE RECIPE INSPIRATION Adapted from Tomato Basil Soup from my column in the St. Louis Post-Dispatch. This was totally one of my favorite recipes of 2013, it comes from Cafe Osage in the Central West End. NUTRITION INFORMATION Per Cup, assumes using 1/2 tablespoons oil: 84/101 Calories; 2/4g Tot Fat; 0/1g Sat Fat; 0mg Cholesterol; 316mg Sodium; 14g Carb; 3g Fiber; 10g Sugar; 2g Protein. WEIGHT WATCHERS POINTS: WW Old Points 1.5/2 & WW PointsPlus 2/3 CALORIE COUNTERS 100-calorie serving, 19tablespoons/1cup. Thanks for this recipe! As soon as I saw this recipe I put it on the weekly menu. It was just what I needed, as I was just getting over whatever it was I had caught. My non-tomato-eaters were not too pleased, but my husband and I liked it, as did four visiting grandsons (and their parents). Some of us found it too rich. Some of us added cooked rice, some of us thinned the soup with some chicken broth. I'll be making it again, and will use both broth and tomato juice to bring it to our taste.